Sigma 6 Electronics brings knowledge and expertise to membrane switch design and pride ourselves on service, quality and competitive pricing. 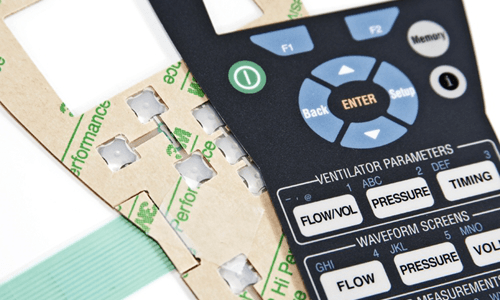 This guide is a basic introduction to design elements and should be valuable information for customers looking to add a membrane switch to an application. If you need more specialized help in a design contact us and we can help design and prototype your interface application. 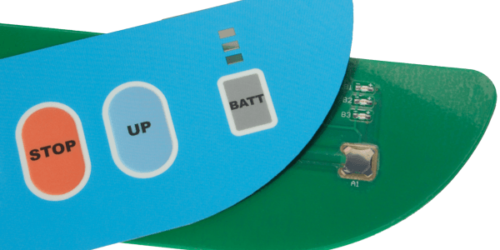 Membrane switch designs are becoming increasingly more sophisticated and Sigma 6 Electronics prides itself on being at the forefront of technology and best practice. 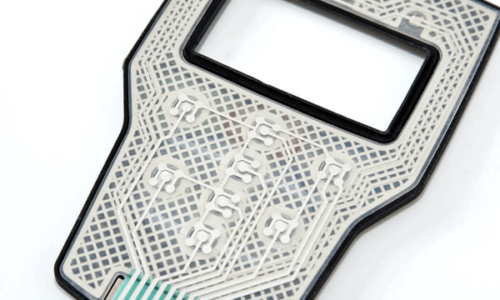 The layers of a membrane switch each serve a critical function within the overall performance of a design. 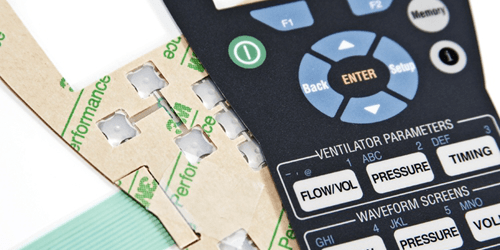 Understanding the layers and their role will allow individuals working on a membrane switch design make informed decisions on the additional elements and components outlined later in this guide. 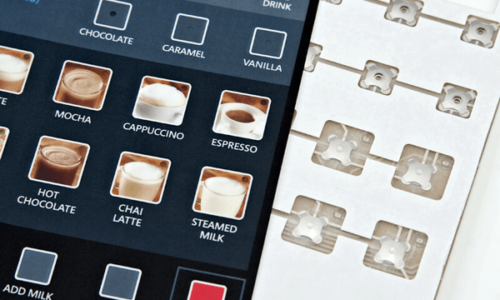 The human interface layer of your product is a critical element in designing membrane switches. Your customers first interaction with your product is typically with the controls. Depending on the application; a polyester, polycarbonate, or rubber keypad could be used. Rubber keypads may provide additional reliability and protection where graphic interfaces may provide unique aesthetics. 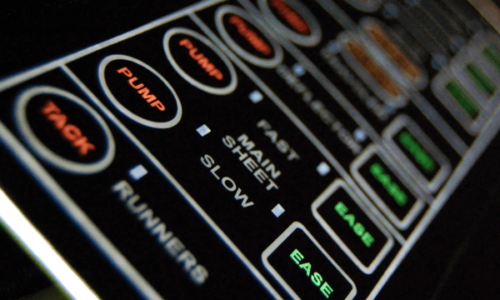 Several options are available for protecting and shielding membrane switches from electromagnetic interference (EMI), electric static discharge (ESD), or radio frequency interference (RFI). The shield is usually connected to the ground through the connector, or by means of a grounding tab with a slot for a fastener. Shielding may add another layer between the graphic overlay and circuit layers. The customer should express shielding requirements in Ohms per square inch. More often than not, shielding is not required; however, Sigma 6 Electronics can help determine the best shielding approach for your membrane switch based on your protection requirements. It’s important to give the user of your membrane switch at least one or a combination of different feedbacks when touching a button: visual, audible or tactile feedback. Domes are available in stainless steel or polyester, in numerous shapes, sizes and with varying actuation forces to provide that customized feel. Tactile feel changes when the interface medium is a rubber keypad. 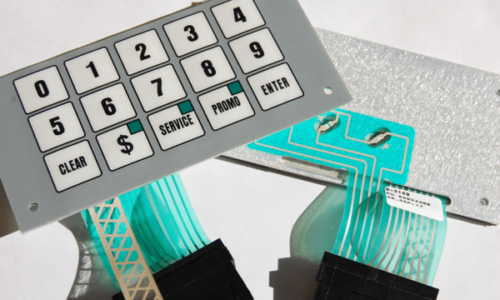 Our Rubber Keypad Design Guide goes over the requirements for good tactile feel when designing a rubber keypad user interface. Some applications might benefit from a capacitive touch switch instead of a mechanical dome. You can check the Capacitive Switch Advantages page to see if your application should utilize this technology. The circuit layer includes the membrane switches electronics: traces, LED’s, shielding, tail length and connector termination. Circuit material is constructed from thin polyester, durable polyimide flex, or PCB material of any thickness. There are several membrane switch design elements to consider when designing a circuit layer; the length of the flexible tail, where to locate its exit point, and how to terminate the membrane switch circuit layer to a controlling board. These elements are usually controlled by other elements in the user interface design/housing. Our product is shipped with a with a pressure sensitive adhesive on the back side. 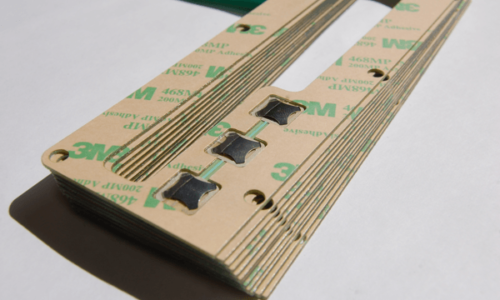 The adhesive is designed specifically for bonding to smooth metal and high surface energy plastic surfaces; however, if a more aggressive or special adhesive is required we can support any type of rear backer. To install the product pressure should be applied to ensure a strong bond which will continue curing for 72 hours after being applied. As a general rule, we recommend removing a small corner of the backing, align and apply part of the membrane switch. Then remove the rest of the liner and apply firm pressure. Never bend a membrane switch in an LED, dome area or try to activate a dome without a firm backer. While the layers of a membrane switch make up the core structure; the components are what add unique superiority to a membrane switch design. These elements add flare and usability ranging from customized housings to practical backlights. The most common backlighting method used is a fiber optic with an electroluminescent panel. 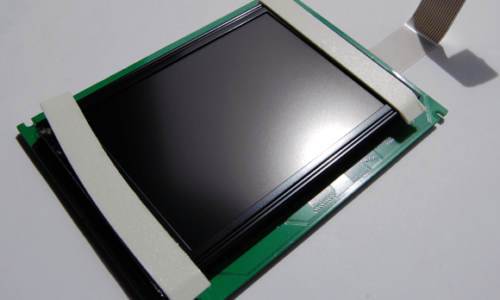 Sigma 6 Electronics works with a proprietary LED design which offers the same uniform backlighting over a large area. Both fiber optics and electroluminescent have large prototyping costs due to tooling. Some applications require an exterior light source or additional layers. Our LED technology embeds a few LEDs to light up a large area and is significantly less expensive in the prototyping stages. Embedding LED’s into a switch layer is a common practice, especially for visual indicator light applications. Sigma 6 Electronics uses an ULTRA-thin LED profile for membrane switches available in all colors and bi-colors. Membrane switch panels are most often mounted to a rigid substrate panel, most commonly aluminum or acrylic. Sigma 6 Electronics can design, manufacture, and assemble any panel. 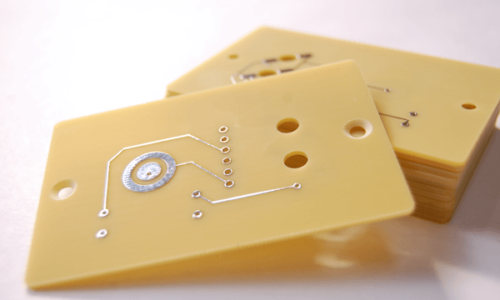 When designing a housing for a membrane switch you need to consider the following critical design elements: tail exit location, stack thickness, special contours and shapes, and conductivity/ESD requirements. Sigma 6 Electronics offers a variety of ways to accommodate connector requirements. 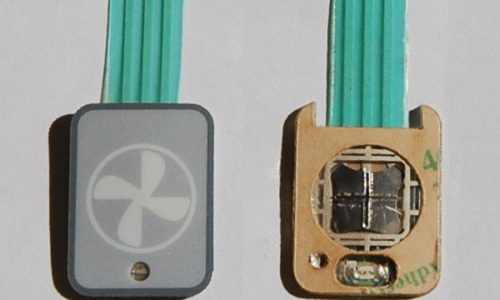 A Zero Insertion Force (ZIF) connection has no physical connector on your membrane switch and relies on a receptacle connector. It’s important to choose a ZIF connector designed for your interface application. Male/Female/Solder connectors are considered to be a more reliable termination against heavy shock or vibration since these connectors physically snap together; however, they require more space in a membrane switch design. Sigma 6 Electronics can engineer and assemble electrical components into a membrane switch design. Products often have main PCBA boards, LCD displays, microphones, or other critical electronics. We can integrate any additional electronic modules into the assembly and provide a high quality finished product. More complex membrane switch designs utilize printed circuit board assemblies (PCBAs) or polyimide flex circuits. PCBAs allow for greater features and control and flexibility in the design. 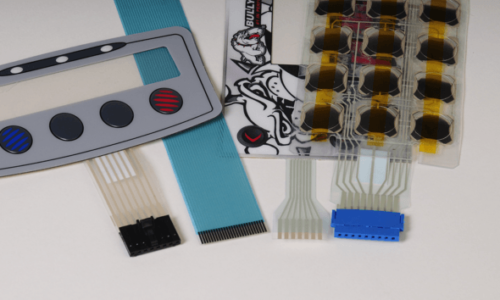 Customers should consider; stack thickness, component location, button location, and connector location when designing the PCBA for a membrane switch. 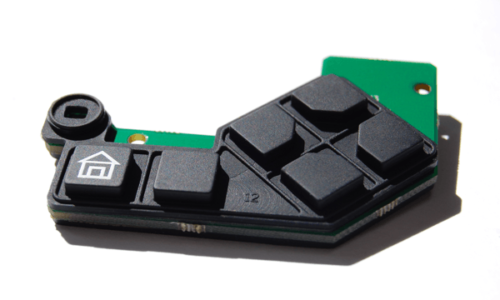 When incorporating a rubber keypad into a PCBA customers need to make sure that they keep in mind specific design considerations including he minimum spacing and dimensions for optimal manufacturing and production. 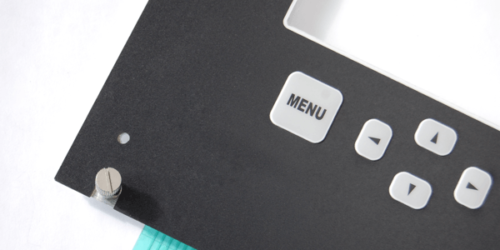 Need more details on the customization and advantages of membrane switches? Check out the Construction and Advantages guide to refine what application best suits your product. Or contact us for individualized assistance!